Could An Asteroid Impact Knock The Moon Into Earth? “If an asteroid hits the moon, it will just get another crater,” says Gareth Wynn-Williams, an astronomer at the University of Hawaii. 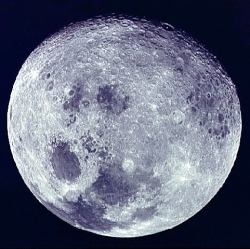 It would take a moon-size object to move the moon, says Clark Chapman, a planetary scientist at the Southwest Research Institute, and most likely the moon wouldn’t survive. Hitting it with a much larger, denser object would be like whacking an egg with a golf club. But let’s say that the moon and the thing hitting it will react like solid billiard balls. None of the known asteroids larger than 60 miles in diameter orbit anywhere near the moon. OK, how about if the largest known asteroid, Ceres—which at 600 miles across is roughly the size of California and Nevada combined—did manage to slip out of its place in the asteroid belt and set out on a collision course for the moon? Hardly a budge, Wynn-Williams says. It’s the equivalent of a four-year-old trying to knock over an NFL lineman. The moon orbits the Earth at some 0.635 miles per second. This orbital momentum is so great that it would overwhelm the impact force of a collision and just continue zinging around the planet.